On April 8, 2015, Professor Svetlana Vladimirovna Popova, a prominent Russian Scientist, senior researcher at the Institute for High Pressure Physics of Russian Academy of Sciences (IHPP RAS) unexpectedly passed away at 79 years of age. 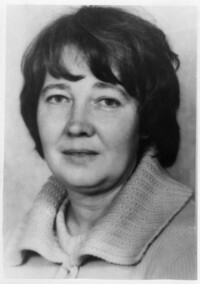 Svetlana Popova began her scientific career at IHPP RAS in 1959 after graduating from the Physical Department of Moscow State University. Quite soon after joining HPPI Svetlana participated in synthesis of the superdense form of silica, later named stishovite. This outstanding discovery inspired Svetlana to continue the study of the irreversible phase transitions in other minerals and compounds at high-pressures. During 70th Svetlana successfully synthesized dozens of new high-pressure phases of oxides and chalcogenides as well as a lot of new intermetallic compounds. Some of them, e.g. TaN, ReC, WGe2 have recently "rediscovered" by other groups. In 1965 Svetlana has got the PhD degree, and then in 1983 - Doctor of Sciences degree. Since the mid 80's Svetlana started to study disordered substances, liquids and glasses under high pressure. Together with her students she discovered and studied an insulator-metal transition in selenium, sulphur, phosphorus and iodine melts at high pressure. Svetlana Popova was a great teacher. She has a lot of students and graduates. Her book "Vysokie davleniya (High Pressures). Nauka. M. 1975", written in co-authorship with Dr. N.A. Bendeliani, has been a manual for several generations of young scientists. Memory of Svetlana Vladimirovna, a talented scientist, a highly intelligent women, a charming person, will live in the hearts of her colleagues and friends.